Waltonchain (WTC) is a project that has caused controversy from it’s ICO during a sensitive time in The Asian crypto markets, but has continued to deliver on the back of a revolutionary team and product in the IoT blockchain space. The WTC blockchain is uniquely built to integrate directly with RFID sensor chips which write directly to the blockchain. This ensures authenticity and ultimately enables teams to build hyper traceable ecosystems. There is massive value in this technology with a large number of supply-chain oriented businesses, and WTC has drawn partnerships with Alibaba Cloud and The China Mobile IoT alliance. WTC has been trading down the past few months with the bear market, but is starting to show signs of life as the team continues to deliver on the roadmap. The Waltonchain platform has also already birthed child chains in Freychain and Fashionchain, and will continue to grow as a leading IoT project in the space. The long-term value proposition is something to keep in mind, and WTC trades at just $6.71 on Binance today. Sign up with your email address to receive our free weekly newsletter right to your inbox. The Dorado team has completed their ICO of DOR token, which will be listed on exchanges in the coming weeks. Dorado has built logistics network using drones that can greatly enhance on-demand delivery, and the team is in prime position to disrupt the online food and commerce logistics industry. This is not just a concept, they have already achieved a successful MVP (Minimum Viable Product) in Foodout Group- which has been operating for 3 years, is active in 6 countries, and has over 1 million platform users. While Foodout Group has focused mainly on last mile food delivery, Dorado will expand that horizon globally to deliver anything that online shoppers should desire. The problem of last-mile delivery is one that the largest service providers such as Amazon and Uber Eats are struggling with at the moment, and Dorado has a big answer. This image from teams website explains how effective their HyperLocal Logistics platform is, which uses blockchain to connect customers to a network of human couriers, drones, and robots(yes, robots) to deliver anything from store/restaurant to front door in just minutes. The token for Dorado's ecosystem is DOR, and it will be used to gain discounts in the network, and access to a variety of user benefits. A big incentive for these tokens is that DOR holders will receive a disbursement of 7% of the ecosystems net sales, quarterly. Considering Foodout Group already earns $50mn USD a year, this is a compelling case for Dorado’s token. The team's roadmap is solid and can be found on their website (www.dorado.tech) 200 million DOR tokens were sold in the public ICO. Look for DOR to debut on platforms in the coming weeks, as it is a project to keep an eye on. Civic (CVC) is revolutionizing the idea of identity management by providing cross-platform, secure, and low-cost identity management services. The Civic platform is actually a blockchain of verified identities, and the ecosystem includes users, validators and service providers. Identity information(Name, Passport, SS, etc) can be uploaded to a user’s phone and secured with a fingerprint scan. This information will be stored only on the phone and can be referenced on the public blockchain through attestations. Validators(FI’s, governments, utility companies, etc) are tasked with ensuring the information put into the public blockchain is correct, by cross-checking with public references; and they are incentivized to do so by receiving CVC tokens in exchange. CVC tokens are the utility token of the platform and will also be used by service providers(hotels, bankes, etc) as a means of purchasing access to the rights of the users' information. This system is a massive improvement from a cost perspective on a sector that is racking up higher costs for KYC (know your customer) processes. It also provides a fully decentralized mechanism of trust and confirmation, which is important given the vast scope of the recent equinox hack. Civic's team is backed by many years of experience from their C-level, all of whom have found great success with companies like Deloitte and RBS. They know how broken the current system is, and have been doing a great job to ensure Civic addresses these shortcomings. The Civic app is already in open enrollment for users, and partnerships between validators and service providers are growing as well. As the team expands, if they can continue to gain adoption, CVC will become increasingly valuable given it’s strongly defined use case. CVC trades at just $0.41 USD on Huobi and Bittrex at the moment. More coins to reward miners (84mn to be distributed total compared to 21mn BTC). These factors make Litecoin an appealing transactional cryptocurrency, and hundreds of e-commerce stores have already adopted accepting payments in the form of LTC, including Overstock.com! Litecoin's website even lays out methods and instructions for merchants to easily implement LTC payment acceptance on their websites. In the last month, 30% of total LTC purchased was in USD - with 50% of the total buys coming from Coinbase. This seems to be a good indicator that more people are discovering Litecoin, and it’s many benefits. After the coin has been beaten up in the bear market over the past few months, it is up 14% on the week and currently trades at $131.91 on popular cryptocurrency exchanges including Coinbase, Bittrex, and Binance. Deploy smart contracts that enable participants to invest and finance green energy projects as well as acquire green energy in an efficient, secure and transparent way. Provide access to live trade renewable energy across the globe, think of this as a green energy ‘secondary market’. 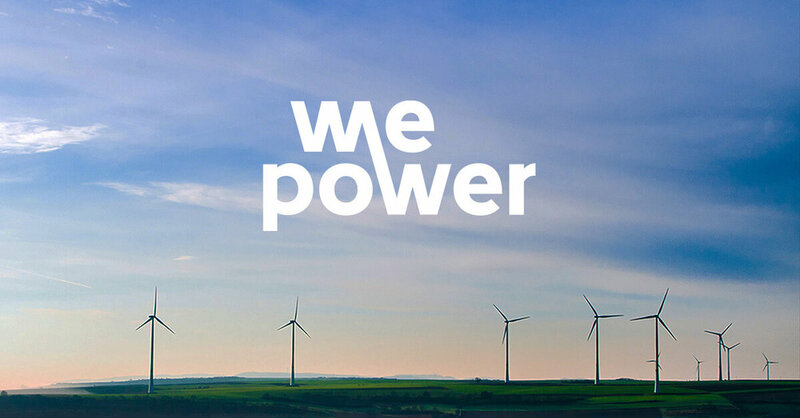 At its core, WePower is a lot like an independent energy supplier that is aiming to take power away from big oil money and put it into the hands of the general public, to help build a greener tomorrow. The team recently met with the European Commission, who was interested in learning more about the vision. WePower also announced a partnership with Elering, who is the main supplier of independent electricity and gas in Estonia. It’s encouraging to see the founder of the project, Nikolaj Martyniuk, has over 10 years of experience in the green energy sector, and spearheaded the building of the largest power plant in the Baltics as CEO of Modus in 2016. The WPR project is still early days, yet it offers a differentiated approach, an extremely applicable use case, and strong ties to the industry leaders and bureaucratic powers that be(whether you want to admit it or not, this is important). WPR currently trades at $0.21 USD on Huboi, and just barely missed out on winning Binance community coin of the month vote (Elastos won the listing). With a Market cap ranking of 165, this is a small-cap crypto project worth paying attention to!